Hello. We are Derek Yost and Jesse Bergmann, Owners / Centre-Directors of Mathnasium of London South, your neighbourhood math-only learning centre. We help kids in grades 2 - 12 understand math by teaching the way that makes sense to them. 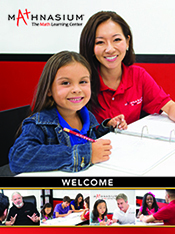 Mathnasium of London South is our second location in the London Area. We help students from all around the city, as well as many students that lives just outside London. If there is a math related issue that you need taken care of, please come in and see us for assistance! My daughter's confidence has grown exponentially since starting in December and even her teacher has noticed more interaction during math. we love it. not only is Nick improving in Math he actually enjoys Math and his confidence has increased. Mathnasium has helped build my daughters confidence in math and we have noticed a great improvement in ability and number sense. We would highly recommend Mathnasium. Everything is great, just wish they were open until 8 or 830pm. Sometimes hard to get there by 630pm to get a full hour in. I am amazed at how much Mathnasium has helped my daughter ! Her grades have been steadily improving , she is understandably the various math concepts taught now so much better than before ! She loves to go to Mathnasium as the teachers are great and make the challenges fun ! Very pleasant staff and very welcoming. They are patient and kind and my son is excelling. Thank you and happy holidays. It's our son's second year at Mathnasium. His confidence and results both continue to increase. Thanks to Derek and his whole team. Better understanding of math at school. Marks have improved. My son enjoys going to Mathnasium to build upon his math skills. What he learns at Mathnasium gives him confidence and the knowledge necessary to excel in math at school. We've noticed he is developing much more than math skills from his experiences at Mathnasium and we thank the staff for all their efforts and support. My granddaughter enjoyed her 2 weeks at Mathnasium. They welcomed her and made her feel comfortable and as as she was from abroad.this was important. Thank you Derick for your help, advice, patience & encouragement! My daughter is doing very well. I’m glad that I decided to sign up. My children feel very positive about going. However it is too early in the process to give written feedback. We have only been a couple times, but Brody is eager to go back! Derek and team are amazing at what they do and how they interact with kids. Not only do they provide a service of helping your child learn math, they also care about your child's success! It's frustrating that in high school, each teacher teaches math differently (and some don't even teach!) and if your child does not respond to the way its being taught - they're lost! Investing in your child's future (as well as taking away the stress of figuring out math homework now) and helping your child achieve confidence in math is completely worth it! Thank you, Derek ,for caring about our children and helping them achieve their goals!! We found mathnasium very flexible, convenient and very helpful with teaching and learning of math. Our son enjoys his time at Mathnasium learning more about math, his skill level and areas to work on. All while building his confidence and preparing him for math skills he requires in life and for gr. 4 next year! Thank you to Derek and his team for all their efforts, support and guidance. We were very pleased with help for our daughter. Extra time would be helpful , ie Fridays, a little more on Saturday or more flexible evenings. With school , after school work and activities it is hard to schedule enough tutor time. Just our suggestions. My daughter has been using your services for about a month now and loves it. She actually asks to go and would stay longer than her limit if she could. Has been great for her. Awesome staff very helpful. Kids like getting treats. Drew enjoys the format of Mathnasium and his mark has gone up 10% within a short time. His mid-term is this week, so we will see. We knew it was a good fit when my son said “ I’m actually learning”. We appreciated the flexibility of an open schedule. Brooke has become more confident in approaching math problems and has improved her math grade! My daughter had a enjoyable experience and I would recommend this to anyone struggling in Math. The 'drop in as you need' approach at Mathnasium made all the difference in the study habits of both my sons. Tradition tutoring meant they would 'stock pile' their questions, waiting for their preset weekly tutoring session to discuss it, causing them to fall behind. At Mathnasium they knew the help was there for them when they needed it. Team was thoughtful, considerate and accommodating. My daughter asks to go regularly. She is more and more confident in her math skills. You made my son feel very welcome and you are very helpful. Our son Karsten who is going into grade 3 in September is really enjoying the math he is reviewing and new math he is learning during the summer program sessions he's attended so far. We'll definitely continue to refer the programs you offer. Thanks Mathnasium for your services it was a pleasure seeing our daughter wanting to be there and learn . That alone is worth the Tuition fee . Liam has had a amazing year of steady achievements in his school studies, paticularly Math. Mathnasium has been a solid investment in Liam's future. Brooke is improving and feeling more confident. The teachers are positive and patient; she really enjoys going. My daughter's math has already improved significantly and she loves attending. The instructors are amazing and the atmosphere is welcoming. We are very happy to be sending our daughter to Mathnasium. I was initially worried that she would not be very receptive to attending math classes after school, and that I would essentially be 'dragging' her to classes. But I was pleasantly surprised at how pleased she was to attend her classes. She really looks forward to going, without any hesitation, and says that she feels calm when she is there. She enjoys earning her stars for work accomplished, and more so when she gets a prize for her many accumulated stars. The instructors are all great and inviting as well, and I can see her comfort as she walks right in, grabs her binder and sits right down to do her work. There is a lot to learn in math, so we look forward to using your services now and in the future! Derek and the whole team at Mathnasium have been fantastic in the short time we've been taking our son there. I never thought our son would actually look forward to doing math homework after school, but he truly does! I tell everyone about our great experience. Brenden is very impressed with the program thus far and is thoroughly enjoying it. Great result his first test considering he has the most difficult math teacher in the whole school board. I loved everything about Mathnasium except the cost structure. It was entirely too taxing on our family to come in 3 times a week...our minimum to make us feel like we were getting good value. Perhaps if my kid was failing grade 12 calculus I would have the motivation to have him there every day at which point it would be phenomenal value. But, for us where "grades" aren't a concern and our son is still young that intensity wasn't desired or feasible. It was a great confidence booster and a great focus on basics. Definitely helped but unless there is an option to pay for a group of "passes" that can be used whenever or a weekly option it's just not the right set up for us. Mathnasium was not a first choice for our daughter, but a friend recommended that our daughter goes there , the flexibility of going from 3:30 -7:30pm is convenient. The math instructors do have a passion in what they do. The choice was the correct one . Thanks Mathnasium for the opportunity for giving our daughter the desire to exel in this subject. Constantino loves coming to Mathnasium. The staff are always very friendly. I also appreciate the regular feedback and written assessments. We look forward to continuing and will recommend to all of our friends. Our son has only been attending for 1 month but helooks forward to going. That is what matters to us as he is is finding enjoyment in math and gaining confidence. Mathnasium has provided both of our children with the valuable learning tools to finally get a proper grasp on math, which in turn has boosted their confidence when it comes to math. Our daughter is achieving marks of 90+ in her grade 9 applied course and finally has confidence in her math skills...something that she has never had up to this point. Most of today's children lack the proper foundation in math that is required to get through high school and into university, and Mathnasium provides the proper learning tools to assist your child in achieving those goals. The owners and staff are great - always pleasant, always motivating and always patient. I love the teachers and I love how the child can be dropped off at anytime during office hours. This flexibility really helps working parents. Nick likes the games room and says there is nothing he doesn't like. I like knowing that he is learning at his own pace and has the opportunity to ask questions when he isn't understand something. My son Chris loves the way he lerns math. My daughter loves mathnasium and not only looks forward to going but ASKS to go! My daughter loves coming there. She has gotten so much better and is improving all the time. It has really helped with her confidence in Math. Her confidence at school has already improved. Friendly and approachable leaders and instructors. Great work environment. Growing confidence seen in my kids when it comes to their math skills. So far very pleased and my teen actually wants to go! Our daughter looks forward to going to Mathnasium, even after a long day at school! Even while she still learning to have better math skills, she is developing a love for math. We love seeing her determined to do her best! My 11 year old daughter hated school because Math was such a problem for her. Since she started being tutored at Mathnasium, she has become so motivated and is more confident. She recently reported that she was able to help a friend at school by explaining how to solve a math problem. I love that Mathnasium has helped to boost my daughter's confidence and helped her to feel proud of herself again. My son is very motivated going every day to Mathnasium. He say," I like to learn math with Mathnasium,I am not bored and the method for learning math is fun. Mathnasium offers excellent services & friendly staff! Our son started a month ago now and he loves going and is already showing more confidence in his math skills! We feel with the teaching techniques & professional and knowledgeable staff members he will certainly benefit from attending! !